I saw a video on LGR and thought, this is a nice system to run my own operating system on. And old hard disks are generally really noisy. The SD-adapter contains an 8 GB SD card, I’m still wondering how many GBs the BIOS can swallow. At least booting from within the first 512 MB over a Grub on DOS seems to work. Also due to the 2 GB limit on LBA in the BIOS I fear some old operating systems can only access the first 2 GB. With a Linux I may be able to use the disk space above 2 GB. 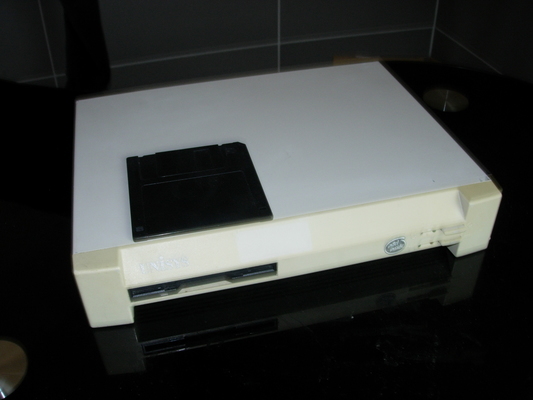 There is a built-in network card (NE2000 compatible, an Accton/UNISYS UK0022, the chips says on the outside). The graphic card is a Cirrus Logic GD5424 which is pretty standard. Instead of repeating all information I found, I have made a list of interesting videos, globs, articles, forums and download locations. You find them at the bottom of the article. First of all you have to bootstrap the machine somehow. I decided to go via DOS 6.22 und first install the 3 standard disks (after doing a fdisk setup with BasicLinux). BL has the advantage of being able to boot from two 1.44 MB floppies. You can then use FreeDOS’ wget port to fetch the rest of the software to install via network to avoid a cramp while swapping floppies. The installation is pretty standard, just remember to install the TCP/IP-Stack to get network connectivity. For the sound card install the CTCU and CTCM programs (ISA plug- and-play for auto-configuration ant utility). Using the latest Native Oberon version from the ETH, install from the OBERON0.DSK floppy. Have the additional files ready on the C:\ drive. There is an excellent blog about how to use Oberon on Vintage Computers, check out the Oberon Tutorial series on Youtube by Andres Ramos. I want to be able to boot a modern Linux kernel and distribution on it. Currently I’m working on a “port” of Archlinux32 to the i486 architecture using the crosstool-ng toolchain (see bootstrap32). The installation process has to be something over iPXE, as a 1.44MB floppy really doesn’t hold a kernel 4.15.x anymore. iPXE itself will need some patching for i486 too. FTP client: as the windows TCP/IP-32 stack for Windows 3.11 provides only quite an ugly text based FTP client.